Has your FreeNAS server crashed? Are you struggling to retrieve the data from your NAS device? Gillware’s ISO 5 Class 100 cleanroom lab, staffed with skilled and knowledgable computer scientists, is the perfect environment for FreeNAS data recovery. There are many features of your NAS server designed to protect your data in the case of hardware failure. Using a mirrored RAID 1 array with two hard disks, a RAID 5 array with one disk’s worth of redundancy, or a RAID 6 array with two disks’ worth of redundancy might make it seem that nothing bad can happen to your server. But bad things do happen to good servers. A power surge might fry both of the hard disk drives in your RAID 1 NAS at once. One of the hard disks in your NAS device’s RAID 5 array might have failed months ago without you noticing, leaving you vulnerable when a second disk breaks down. Maybe your office floods and your NAS server is one of the casualties. Maybe someone accidentally deletes an entire iSCSI target or LUN and wipes out all of the valuable data. All of these scenarios might sound unlikely, but they do happen. We know they happen because these exact situations have brought countless people to Gillware’s data recovery lab since 2003. As powerful and versatile as FreeNAS is, like any other NAS software (open-source or not), it’s not immune to crashes, hard disk failure, boot drive issues, or anything else that can stop it from working properly. Some types of hardware failure, such as a failure of its boot disk, will not imperil all of the data you have stored on the NAS. However, the disks in your NAS that contain all of your data could become corrupted or break down for a variety of reasons. When this happens, you might need help retrieving your data. How do NAS devices fail? NAS devices have a lot of failure points. Every hard disk drive in your array can break down–and, in fact, will break down eventually. Most hard disk drives have a lifespan of around five to ten years, depending on the workload you saddle them with. Whether or not the hard drives are enterprise-grade makes a difference. Whether or not they came out of the factory with a defect makes a difference. But all the same, every hard disk drive dies sooner or later. Sometimes sooner. And never when you expect it to. And not only that–every NAS device has an operating system of its own, just like your computer, and that operating system can become corrupted, preventing your NAS device from working properly. For FreeNAS devices, the operating system is stored on a boot disk, which can itself break down just like the hard drives containing your data. Some of the ways your FreeNAS server can fail are minor inconveniences. Some are major headaches. And some are catastrophes. If your FreeNAS server fails, Gillware can provide easy, painless FreeNAS data recovery services in our ISO 5 Class 100 cleanroom lab in Madison, Wisconsin. FreeNAS is open-source network-attached storage software designed to help people share data over a network on virtually any hardware. While it takes a greater investment of time and labor and more computer acumen to set up and manage compared to a store-bought NAS device, FreeNAS is extremely flexible. FreeNAS servers are just as vulnerable to hardware failure as any other NAS device. The operating system and critical boot files of a FreeNAS server are stored on a “boot disk,” which is often a USB drive or solid-state drive connected to the NAS hardware. If the boot disk fails, the entire NAS becomes inaccessible; however, there is little risk of permanent data loss. You do risk losing all of the data on your NAS, though, if one or more of the hard disk drives inside your NAS break down. How do you fix a “This is a NAS data disk and cannot boot system” error message? This error message might sound serious, but it usually isn’t. 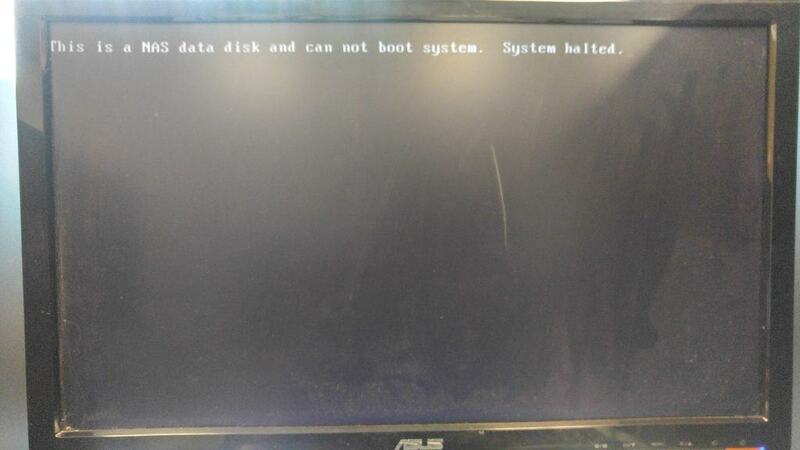 It means that the FreeNAS operating system could not be found, which typically indicates a problem with the boot drive. If your FreeNAS won’t boot from USB, you will either need to go into BIOS and change the boot order or create a new FreeNAS boot drive. While this might be tedious and time-consuming, the good news is that your data is usually intact. Why choose Gillware for FreeNAS data recovery? Gillware’s team of computer scientists and engineers know RAID arrays backward and forward. The only people who know more about open-source file systems like ZFS, which is the most common file system used in FreeNAS setups, are the creators themselves. When it comes to salvaging data from crashed NAS servers, whether they’re made by Buffalo, Drobo, Synology, or any other NAS manufacturer, our engineers have unparalleled success rates. When your NAS crashes due to multiple hard disk drive failures, it takes mechanical engineers with years of experience and in-depth knowledge of the inner workings of all brands and models of hard drives to effectively recover the data from them. There are no schools that teach these highly-specialized skills–our engineers became the best through thousands of hours of hard work and training in our data recovery lab. Once the data has been salvaged from the hard disks in your FreeNAS server, it takes computer scientists with in-depth knowledge of how RAID arrays work to piece your data back together and ultimately send it back to you. Gillware is more than well-equipped to deal with your FreeNAS data recovery issue, no matter what form it might take. Losing the data on your NAS server is a stressful situation no matter what you use it for. Whether you’re a home user, self-employed, or small business owner, a NAS server crash can be devastating. Maybe you had your data backed up and can easily recover it. Or maybe that shared folder you set up on your FreeNAS server was your backup. If a server crash blocks access to files that are mission-critical, the prospect of losing those files forever–and the severe consequences that come with that–are rightfully terrifying. Fortunately, Gillware has been providing data recovery services for over 15 years with a mission to provide the best, most stress-free, and most painless solutions to data loss. Our data recovery engineers have so much skill and experience that we’ve practically written the book on NAS device data recovery–or at least contributed quite a few chapters. We have hardware and software at our disposal the likes of which no other data recovery lab comes close to having. And we have friendly advisors on hand to guide you through our entire data recovery process and answer any question you might have about our services. All you have to do is contact us to set up a free evaluation by our team of FreeNAS data recovery experts and you’ll soon be on your way to recovery. If you need your data retrieved as quickly as possible to minimize your downtime, make sure to ask about our emergency data recovery services.